Apple has made a big deal about how the iPad Pro can fit right into the enterprise setting, even bringing up Microsoft on stage to show off Microsoft Office on the new iPad, but in reality, the iPad Pro may be the ultimate family tablet. There are a number of things you notice right off the bat about the iPad Pro, including that huge, beautiful screen. But what makes it a better iPad for the home isn't so much how it looks as how it sounds. Let's get some of the technical specifications over with before we get into the meat of the iPad Pro. The 12.9-inch screen provides around 75% more real estate than the iPad's 7.9-inch screen and the 2732 x 2048 screen resolution packs in around the same pixels-per-inch, which means you'll get the same screen clarity with a much bigger display. The A9X processor powering the iPad Pro is a dual-core processor, which is interesting considering the A8X in the iPad Air 2 has three cores, but Apple has boosted the raw speed of the iPad Pro's processor. The end result is a CPU and a graphics processor that both run about twice as fast as the iPad Air 2. How fast is it? The A9X processor benchmarks at around the same score as the $999 Microsoft Surface Pro 4 that has been upgraded to the Intel Core i5 processor. The i5 processors are the mid-range Intel processor, so what Apple has done is release an iPad that clocks in as fast or faster than most laptops. In fact, the iPad Pro clocked in faster than the 2015 Retina MacBook Pro running an i5 processor. It is also important to note that iOS is a much thinner operating system compared to Mac OS or Windows. This means the iPad Pro will feel even faster. With Apple upping the amount of RAM memory used for apps from 2 GB to 4 GB, you can multitask and switch between different apps lightning quick. The first thing most people will notice about the iPad is that huge screen. The second thing they'll notice is the keyboard. No, not the much-publicized Smart Keyboard. That won't release for another few weeks. I'm talking about the on-screen keyboard. When you are holding the iPad in landscape mode, the on-screen keyboard is about the same width as the keyboard on the 15-inch MacBook Pro. A full-sized desktop keyboard beats it out by a fraction of an inch. And most of the keys are about the same size as on a regular keyboard. The only keys that are smaller are the top row of numeric keys. Wait. Backup. Yes, I said the top row of numeric keys. The iPad Pro's keyboard now lets you type in letters, numbers, and symbols all from the same keyboard without switching to a different layout. And this makes a huge difference in terms of productivity. Even without a physical keyboard, writing content becomes much more easy on an iPad Pro. And when you add in the new virtual touchpad introduced with iOS 9, manipulating text onscreen is a breeze. But the biggest difference between the iPad Pro and the iPad Air 2 other than screen size and raw power is the sound. This is where the iPad Pro becomes the ultimate family tablet. The iPad Pro has four speakers, with one at each corner of the tablet. It also has the ability to balance the speakers, so it can change the way the sound outputs based on how you are holding the iPad. This means it sounds great pretty much all the time. Can it replace your work laptop? Apple is pushing the iPad Pro as an enterprise device, and that might need a lot of pushing. Sure, the iPad is already making some inroads into the enterprise, and the iPad Pro will help. But Apple's design philosophy of making things simple and thus easier to use hurts it here. For example, where's the USB support? I'm not talking about a USB port here. We can easily solve that one using the Lightning connector to hook into a USB hub. But if you are going to operate in a corporate environment, being able to hook in an external drive or a Flash drive would be nice. As would better support for network drives. And while a virtual touchpad is nice, how about support for a mouse? The biggest detractor for the iPad Pro taking over as a work laptop is the proliferation of proprietary Windows software in the corporate environment. If your company built an elaborate back office system that only runs on Windows, and you need access to that system, it's going to be a lot harder to use the iPad Pro as your only work computer. As more companies jump on cloud computing as a better solution, the iPad Pro becomes a more viable solution. Can it replace your home computer? In terms of raw power, the iPad Pro will have no problem taking over as your home computer. But similar to its ability to invade the enterprise, part of the equation will be whether or not there is an iPad equivalent to the software you need. The bigger screen and ability for split-screen multitasking allow you to easily do work between two different apps, and when you add in the additional memory and fast app-switching, you can juggle three, four or more apps perfectly fine. But if it can't run the software, that additional horsepower won't do you any good. What software do you actually use on your PC? There is an amazing amount of productivity software available for the iPad. Even more software that now runs in the cloud. The iPad Pro comes with the iWork suite of apps, which includes a word processor and a spreadsheet. It also has Garage Band and iMovie preinstalled. For many people, the iPad already does everything they need from a home computer. Add in the better on-screen keyboard, and you won't miss a physical keyboard near as much as you might think. And the bigger screen makes it perfect for work, play or even a combination. How cool is that bigger screen? When using the picture-in-a-picture feature, you can stream a movie to a window that is less than a quarter of the iPad Pro's screen and is roughly the same size as an iPhone 6 Plus. Nothing makes typing up a long email less onerous than watching the latest episode of The Walking Dead while you do so. Apple has a shipping date of about 3-4 weeks out for the Smart Keyboard and the Pencil, so it isn't possible to give them a full review at this time. The Smart Keyboard utilizes the new connector for the iPad Pro, which means you won't need to connect it via Bluetooth to get it working. The iPad has had support for wireless (and even wired) keyboards since the beginning, so while the Smart Keyboard may end up being the best keyboard for the iPad Pro, it's not quite as revolutionary as Apple would have us think. Perhaps more important for many will be iOS's new support for special key functionality, so if you have dedicated copy and paste keys on your keyboard, you can use those with the iPad. The Apple Pencil may be the real revolutionary product here. The ability to use both pressure and angle to affect the stroke will make creating beautiful drawings on the iPad much easier. 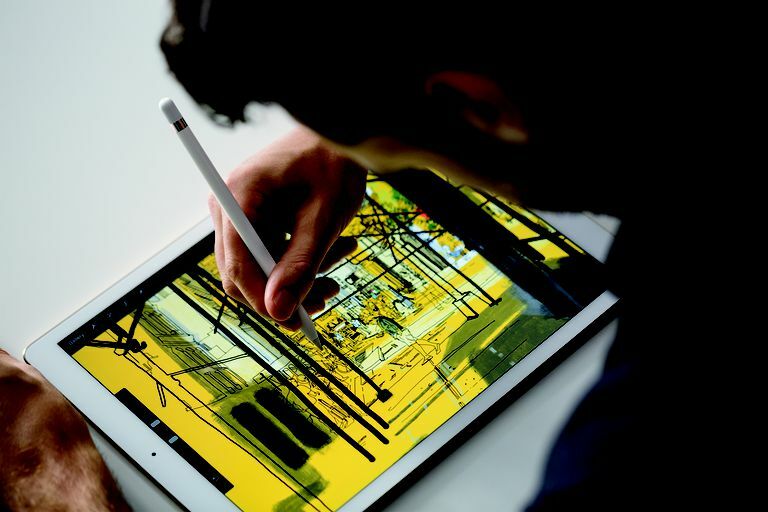 This will make the iPad Pro a perfect tablet for graphic artists. As an iPad, the iPad Pro gets 6 stars out of 5. Yes, it's that good. It's as fast as a MacBook, as pretty to look at as a MacBook, sounds better than a MacBook and weighs around 1.6 pounds. It's the first iPad since the original to produce that magical feeling of carrying a screen around with you. As an enterprise tablet, it still comes up a little lacking. There are still too many ways the iPad and the iOS platform ​need to evolve before we see the iPad Pro really invading corporations across America. It can be great at specific jobs, and it will certainly find a niche in the enterprise, but it may take a change in design philosophy at Apple before they are capable of ushering in a post-laptop corporate world. The iPad Pro starts at $799 for the 32 GB model. A 128 GB model runs $949 and the 128 GB model with Cellular access will set you back $1,079.